Bonn – Morocco is resolutely committed to continue its climate action with the aim of consolidating the concrete results achieved under its mandate as chair of the 22nd United Nations Climate Change Conference (COP22), said, Monday, Salaheddine Mezouar before passing the torch to the new Fijian presidency of COP23, which opened in Bonn, Germany. “Morocco is regaining its place as a Party within its African family, other groups and the global community. As a country, we will continue to make a strong commitment to climate action,” said the outgoing COP22 president at the official opening ceremony of COP23, which will run until November 17. 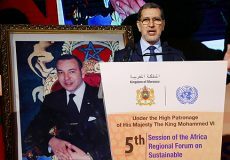 “Since COP 22, concrete results have accelerated at all levels according to the values of ambition, solidarity and action,” he said, highlighting the positive results of an “inclusive” Moroccan presidency. 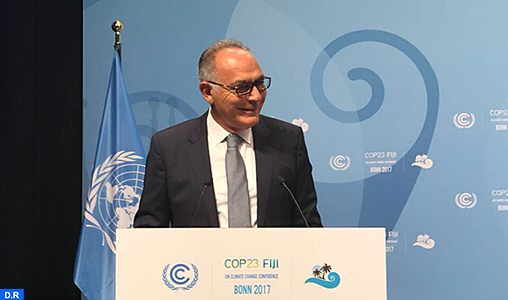 As an illustration of these achievements, he cited the Yearbook on the Marrakech Partnership for Global Climate Action, which notes that since COP22, nearly ¾ of initiatives have made new commitments to Climate. 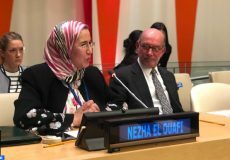 “We were also the first presidency to hold a Post COP meeting with observers and civil society actors in February,” Mezouar said, adding that non-state stakeholders are increasingly recognized as important actors in climate change governance. The opening ceremony of COP23 was notably attended by executive secretary of the UN Framework Convention on Climate Change (UNFCCC), Patricia Espinosa, secretary-general of the World Meteorological Organization (WMO) Petteri Taalas, and German Environment minister, Barbara Hendricks. 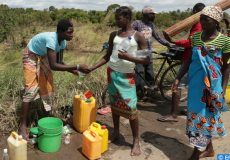 With the “one conference – two zones” concept, COP 23 will highlight the importance of climate activities undertaken by various non-government players and supplement the negotiations and concrete action.